Our song list is always changing! We always keep a current set of recent radio hits. Life Support performs music from new artists such as Bruno Mars, Adele, Pink, Lady Gaga, etc. Our song list does not contain many songs that we can ”wing” on a moments notice! 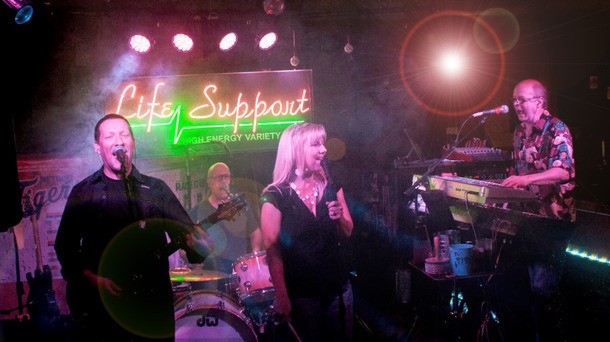 Life Support is a very experienced band that, over their personal careers, has played most Pop/Rock songs of the last thirty years. In addition, we carry “Fake Books” and iPads to help us take requests. We are constantly adding new songs, so please ask if there is a song not listed. NOTE: Our song list does not include most standards (Frank Sinatra era) but we can perform many of them instrumentally. Life Support has been a performing unit for fifteen years, with over 140 years of combined performing experience. The key members of the band consists of Nikki Fowler on lead vocals, Ricky Nalett on keyboards and vocals, Bob Giunta on guitar and vocals, and Donny Brown on drums and vocals. And on special request, our fifth member of Life Support, Bronnie Brown. Life Support was one of the premiere bands at “The Beer Barrel” in Put-In-Bay for several years. We are one of the top requested bands on Mackinac Island for performing wedding receptions. Life Support is much more than your typical “bar band”. We have a unique ability to perform anything from jazz standards, classic rock, to songs from recent artists. If you want a talented band who pays attention to detail, you want Life Support !! We appreciate the opportunity to serve you and look forward to providing you with the same high quality our clients have come to expect from us throughout the years.